PRODUCT: Backer Rod COMBO Insertion Tool Set (both for walls and corners). Set includes 640-6 and 640-5 Tool Sets. 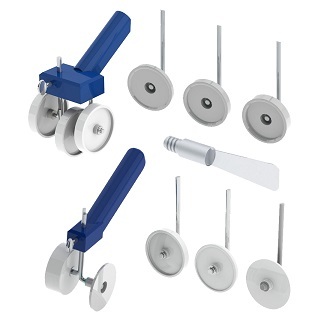 Includes wheels 1/8, 1/4, 3/8, 1/2 inch wide; tamping tool; regular 2-wheel insertion tool; corner insertion tool. Price/Set. DESCRIPTION: Backer rod insertion tool enables quick installation and accurate depth setting of backer rod for both walls and corners. Depth of setting is adjustable. Does NOT accept broom handle pole/handle. Replacement wheels available. Made by Albion Engineering.